Are you penny wise but pound foolish? We just received our open enrollment package. Our insurance is going up 42%. This is one of those rare times when people share financial information at my place of work. How much their 401k tanked last year (we also have our 401k annual review meeting on the same day as our open enrollment meeting), how much they spent on medical bills, what big medical expenses they are expecting this year, how are they planning to save for it, etc. Picking the wrong health insurance : Everyone talks about how wonderful High deductible health plans and HSAs are. They are good ONLY as long as you are healthy enough to not have frequent doctor visits. If you have any medical conditions and a doctor you regularly go to, it might just make sense to pick the right HMO and pay the extra in insurance premium. Not going to the doctor for regular check-ups : It is one thing to save money by shopping for insurance, but some people don’t go to the doctor at all to save money. If you leave any conditions untreated or worse undiagnosed, you will pay a lot more than money. Opening a store credit card for x% off : Opening a store credit card to save 15% off and then paying it off slowly at an interest rate of 30+% and late fees. Hunting for low gas prices : Driving around looking for the cheapest gas station or driving half an hour out of the way to save 5c off a gallon. Or obsessing about gas prices but buying a costly gas guzzling SUV. Storing junk while leaving your car outside : I really couldn’t understand this logic when I first came to the US. People store their junk and unwanted items in the garage and fill it up. But park their expensive car on the streets. Why? Not hiring a tax accountant or hiring the wrong one : For most common tax situations tax software do a great job, so there is no need to hire a tax accountant. But some situations might warrant hiring one, at least for the first year, when handling a new life situation. We try to do it ourselves and miss out on tax deductions. An even worse mistake is going to a tax accountant who charges a % of your return and promises to get as much back as possible. You will be paying a lot more to the IRS in taxes and penalties. Buying the cheapest product without paying any attention to the quality and having to replace it frequently because of poor quality. This is one of my favorites – Parking and “just running in” to pick something up without feeding the parking meter, but returning to a parking ticket attached to your windshield. Using coupons to save money while buying something that you won’t be using. Waiting to learn to choose the best funds for investing and not starting to contribute to a retirement fund right away. You certainly picked the good ones. There used to be a Frahm commercial that said, you can pay me now or pay me later. The essence is ignoring health issues, does not make it go away. I am extremely healthy, but take a fair amount of prescription drugs. If I did not take them, I would not be healthy. A routine physical or eye check-up discovered these issues. While it’s good to have an HSA you have to make sure you have the time and the follow through to submit all your receipts. My Dad lost about $2000 by setting it aside but never taking the time to gather and submit his receipts. The small tax savings won’t make a difference if you don’t get your money back. Thank you for the reminder that thinking savings through is your best option. Putting off dentist visits. Brushing and flossing may not be enough. You need to catch a problem while it’s small and (relatively) cheaper to fix. Putting off auto repairs. That funny little noise can segue to the sound of a tow truck coming to rescue you on the freeway. Putting off home maintenance and repairs…and also car maintenance. Not taking care of your stuff in general is a place where I see a lot of people waste their money. It costs $30 for a grill cover and your grill won’t rust out after 2 years if you use one…mine is almost 15 years old and still looks like new…leaving tools and bikes outside to rust, etc. Good article. I completely agree! Driving all over town to save a little bit on groceries. There’s a good chance that what you’re spending in gas is eating up whatever you’re saving on food. Buying cheap instead of quality (I know that sometimes you can only afford cheap, but if you can afford better…) I see this especially in tires, where for an increase of 50% in cost, you can double the lifespan of the tires, making them less expensive in the long run. I think sometimes it’s easy to get swept up in “savings” without realizing you’re not really saving. Like saying “I saved 40% at the dept. store today,” but you didn’t need anything I bought. Regular checkups is a good one. We are lucky enough to have really great health insurance and we don’t pay for most anything but this is something we would do regardless of cost, because of the long run. On number 1 – I would caution that you should read the documents on the HDHP plans. Many companies do pick up more of the premium when it comes to those types of plans. In our case (Married, no kids) the HDHP (and attached HSA) will be cheaper at every spending level up to and beyond the deductible. Like you said, at lots of companies your mileage may vary – but your company might subsidize the HDHP folks. Number 5 made me literally laugh out loud. When we were first looking for houses I asked my wife (who’s from California) why everyone stored so much junk in their garages. She’s a clever lady, and immediately deflected – “because we don’t have basements”. TouchÃ©. I would add not taking care of the things you already own and being organized. I now someone who kept purchasing deoderant because they couldn’t find theirs. I helped her clean her house recently and found 7 of them! Also, we take good care of all of our possessions – for example, we recently sold a car we bought 8 years ago for our daughter. We paid $2000 for it and sold it for $1500. Not bad, for 8 years of use. 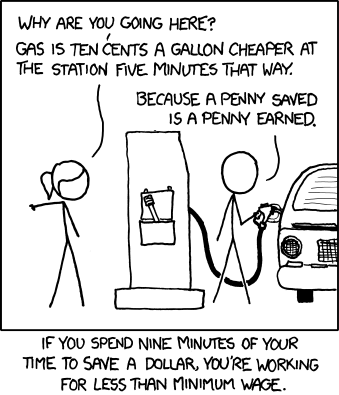 I’ve been guilty of doing many of these in the past, and still do crazy drive around for cheaper gas tactics, sometimes. I can’t help it. I rationalize with almost all of my spending and end up getting burnt. I disagree with your bit about the HDHP and HSAs, but I guess it depends on the details of your plan. The one I have at work has a deductible you have to reach each year, and then over that, the coverage is 100%. If I was extremely sick with cancer or something, I know exactly what my max. out of pocket expense each year would be. If I had a regular health plan with co-pays, then I could be facing daily after-tax co-pays if I was hospitalized long-term or something. This happened to a friend of mine who had a young daughter who needed a bone marrow transplant. She was hospitalized for over six months and he had DAILY $40 co-pays. If he’d had a HDHP for his family, his out of pocket max would have been limited to his deductible. As long as I keep more than enough money in my HSA account to cover the deductible, I know I’m good. I also conveniently have a debit card for my HSA account – I have to keep up with receipts, but don’t have to be reimbursed, which is nice. I also enjoy not having to budget for medical expenses – contributions are taken out pre-tax, so I don’t have to make room in my regular monthly budget for co-pays. The fact that the money is pre-tax dollars is also a huge bonus. In my case, I don’t have to worry about an insanely high deductible or sharing the costs after the deductible is met (since I got 100% coverage after the deductible is met, rather than 80%), but the premium on my plan, with a super low annual $1250 deductible for a single person, is still half of what it used to be on our old standard plan, which had co-pays starting at $30 per visit. Plus all “preventative visits” are totally free. I really don’t know why more businesses don’t use them. SA, I agree it depends on the plan. Most common HD plans have $3000-$5000 deductible. If the low copay-all-covered insurance costs you $100 a month and the HD plan costs you $20 a month, with 12 months, the $100 plan still comes out ahead. It might cover everything after $5000, but $5000 even pretax is still close to $3000-$4000 after tax that you would have to pay. I have personally seen a lot of people just choose that plan without thinking about their health (like pregnancy which my plan requires me to cover $5000 before they pitch in). And there is also the per visit copay comparison etc. I just wanted to point out to not choose a plan because everyone talks highly about it. It has to be compared and the best plan for individual situation should be chosen.